The traditional definition of aid is being eroded at the same time that governments have committed to achieving the UN's ambitious Sustainable Development Goals (SDGs), Jeffrey Sachs special adviser to the UN Secretary-General on development told IPS Thursday. The Organisation for Economic Cooperation and Development (OECD), once a domain of the rich countries, is keen to extend its global membership and has set out a clear path for Costa Rica’s membership, within months of launching accession discussions with Colombia and Latvia. G7-based companies and investors cheated Africa out of an estimated six billion dollars in a year through just one form of tax dodging, according to a new Oxfam report ‘Money talks: Africa at the G7’, released Jun. 2. Development aid flows were stable in 2014, after hitting an all-time high in 2013, but aid to the poorest countries continued to fall, according to new figures released on Apr. 8 by the OECD Development Assistance Committee (DAC). In response to rising demand for electricity, pressure to keep prices affordable and a need to maintain energy security, the Turkish government plans to increase electricity generation from coal. In the face of the growing number of crises taking place at the same time worldwide, humanitarian aid organisations – many of which have already reached their financial and logistic limits – are in desperate need of global coordination. For years, many policy makers, including economists, have clung to the belief that if states do nothing to boost income equality, market forces will cause wealth to trickle down to the poorest citizens and contribute to overall growth. If former New York mayor Michael Bloomberg had used the Vélib’ - Paris’ public bicycle sharing system - to arrive at the headquarters of the Organisation for Economic Cooperation and Development here Wednesday, he might have sent a stronger message about the need for cities to be “empowered to take the lead in combating climate change”. Inequality, poor infrastructure and declining trade are some of the problems that Latin America needs to overcome if the region truly wishes to achieve a “golden age”, according to Peru’s President Ollanta Humala. On his first day of fourth grade, Efraín found there were no desks or benches in the classroom in his Mexico City school. His parents had to help the teacher haul in furniture from other rooms so the children wouldn’t have to start the new school year sitting on the floor. Technology education programmes are increasingly becoming a viable alternative to the standard four-year undergraduate university programme, according to the OECD, a major international grouping of rich countries. 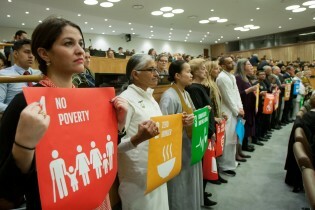 With the level of Western aid to the world’s poorest countries declining amid the global financial crisis, economists are calling for “innovative” means of development that range from proper taxation of multinationals to laws that ensure gender equality.